A nutritional supplement containing a pure blend of herbs formulated to support your dog’s essential needs. Providing support for optimum health, vitality and well being. Suitable for all feeding regimes, either as a top up for a dog being fed on a complete food, or as an essential supplement to a natural raw diet. 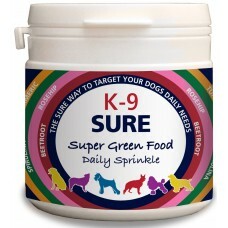 K-9 Sure Super Green Food is an holistic supplement containing a unique blend of Herbs to be given as part of your dogs daily feeding regime. Seaweed’s (Kelp & Bladder wrack): A rich source of Iodine, essential for thyroid function, weight control and growth and development. Also rich in minerals including magnesium which is essential to calcium metabolism, muscle health and function, energy, cardiovascular health, hormonal balance and nerve health and function. Magnesium also works with vitamins C, B6, pantothenic acid and zinc to help support the adrenals and help with stress. Rose Hips: Rich in vitamin C, a potent anti oxidant helping neutralize free radicals in the body. Immune supportive. Cardiovascular support, Cell protective, Joint support, Anti–Allergic. Beetroot: Since Roman times beetroot has been used for its health benefits. Rich in anti-oxidants. Great for boosting stamina and making muscles work harder. It also contains potassium, magnesium and iron as well as vitamins A, B6 and C, and folic acid. Research has shown that beetroot can help reduce blood pressure as well as its associated risks such as heart attacks and strokes. Beetroot also improves blood supply to the brain, which may be useful with memory and brain health. Hemp Seeds: Contains high levels of vitamins A, C and E and β-carotene, also, rich in minerals like phosphorus, potassium, magnesium, sulphur, calcium, iron and zinc. As a food, hemp-seeds are nutritious they contain an excellent balance of polyunsaturated fatty acids (omega 3 and 6). The Hemp seeds we use are de-hulled for easier digestion. Turmeric: Many studies show that Turmeric has major benefits for your body and brain. Shown to supports liver function, helping to protect against toxins. A digestive tonic, helping with gastritis and hyper-acidity. A well known potent anti-inflammatory. Aniseed: An excellent source of many essential B-complex vitamins such as pyridoxine, niacin, riboflavin, and thiamine. Pyridoxine (vitamin B-6) helps increase GABA neuro-chemical levels in the brain. The seeds are the great source of minerals like calcium, iron, copper, potassium, manganese, zinc and magnesium. Potassium is an important component of cell and body fluids that helps control heart rate and blood pressure. Copper is a co factor for many vital enzymes and is also required in the production of red blood cells. The seeds also contains good amounts of anti-oxidant vitamins such as vitamin-C and vitamin-A. Helps maintain optimum health,vitality and well being.